Wood colliers, more commonly known as charcoal burners, were a common sight in the woodlands around Sheffield until the early years or the twentieth century. Although the bulk of the woodland lay to the west of the city the work was generally not undertaken by locals, rather the burners travelled in from the steel orientated eastern areas. They bought their raw material from local woodsmen in 'cords', each of which was eight feet long, four feet wide and five feet high. These they built into a circular shape, tapering from the base to the top, finally topping their stack out with sods. It was their tradition to light these stacks on a Sunday, thereby enabling the charcoal to be available for sale on either the following Friday or Saturday. Although by its nature a hazardous profession, it was the burners proud boast that no wood collier had ever set a wood ablaze. Fire it was however, that caused the premature demise of one such burner. 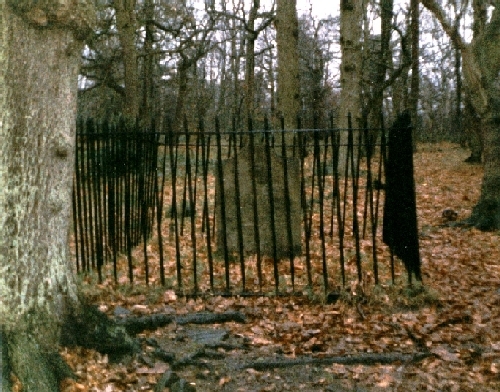 Documentation provides us with no details about George Yardley, the only known facts about him are those recorded on a lonely grave in Eccleshall Woods. These state that he was burned to death in his cabin on October 11th. 1783, being subsequently buried at the same spot. The grave also carries the names of four others, presumably those who bore the expense of his headstone. The first, William Brooke, is described as a salesman. He was probably the person who had sold George Yardley the wood for his trade. Second is David Glossop, gamekeeper, who would no doubt have kept a watchful eye on all the wood colliers, ensuring that no danger befell the surrounding woodland. Next was a Thomas Smith, a besom maker. He would also have been a regular visitor to the wood following his trade along with several others. Finally there is a Sampson Brookshaw, innkeeper, believed to be the then landlord of the Rising Sun who would no doubt have met George several times, especially around his pay days. Local folklore maintains that George was an habitual drunkard, occasionally tending his stack whilst in an inebriated condition. The tale continues that he stumbled back to his cabin one evening after a bout of exceptionally heavy drinking, dislodging part of his stack which, unbeknown to him, smouldered on, finally causing it to ignite his quarters whilst he lay asleep. Historical accuracy must dictate however, that no recorded facts support such a tale.